Simple, sleek, and subtle, The Gate is a heartwarming tale of two social outcasts and their love for one another; under this straightforward veneer, however, lurks a more anxious and compressed set of insights on interpersonal relations, the nature of disappointment, and the universal quest to find peace with one’s path. Sometimes the right book comes to you at the right time. Much rarer, I imagine, is the circumstance I currently find myself in: poised on the precipice of a major life event — marriage — I seem to have found myself stumbling upon a series of right books at the right time. It began with A Heart So White which, though the virtues of matrimony were certainly not the novel’s central thrust, indirectly ended up extolling the constancy and stability of marriage when compared to myriad other romantic arrangements. The protagonist harbors some incredible reservations about married life, but as the course of the novel presents him with alternative options, his ultimate decision — whether as a result of attrition or actual persuasion — was to put a ring on it. I found myself in a similar position last November when I finally scaled the mountain that is Anna Karenina. Tolstoy was no champion of the progressive woman (and there is certainly much to balk at in the novel’s message), but by cycling through his portraits of different households, the reader begins to see what sort of husband-and-wife relationships are sustainable and which are not. Although it comes with risk, the quiet dependability of domestic life is, perhaps, the highest attainable virtue. In line with this progression, enter The Gate, a little-known 1910 Japanese novel by Natsume Soseki. Soseki is evidently unconcerned with marriage as an institution (although the fact that his two key characters — Sosuke and Oyone — have married against the will of both of their families is the source of their ostracism from society). Rather, marriage in The Gate provides a convenient environment in which to examine both the intense interpersonal connections that can develop between two people in isolation and, also, how those connections might preclude more far ranging interactions with society in general. The ostracism of Sosuke and Oyone is only partially externally imposed; it becomes quite clear in the opening pages of the novel that the two of them find great comfort in the exceedingly cloistered, simple, and predictable pattern of their lives. The pattern goes like this. Sosuke and Oyone arise every morning and breakfast together in their humble residence on the outskirts of Tokyo. Thereafter, Sosuke begins a long commute into the center of the city where he works as a low-level bureaucrat making a trifling wage that allows he and his wife to subsist above the poverty line. Oyone tidies the house while he’s away and prepares food for the evening meal. When he returns, they dine, chat for a couple of hours in the living room, and go to bed early. Occasionally, one or the other of them goes to the public bathhouse to clean up. On the weekends, they make plans to accomplish many tasks, but generally end up lounging about in a pleasant, conversational stupor. Sosuke does not associate with his work colleagues socially and Oyone appears to have no girlfriends except for the housemaid (who is granted, I believe, something like six words of dialogue in the entire novel). The pattern is interrupted like this. Sosuke has a much younger and hotheaded brother, Koroku, whose educational expenses are supposed to be provided for by an uncle. When the uncle dies, his wife reneges on the offer and Koroku is suddenly financially destitute. He moves into Sosuke’s home, shattering the isolation of his domestic life, and the two of them begin to explore various ways that they might continue to fund Koroku’s education. Furthermore, Sosuke’s landlord — a wealthy man named Sakai, who lives in the building next door — begins to take a social interest in Sosuke after a handful of chance encounters between the two convinces him that Sosuke is an odd fellow who might be worth talking to. The problem here is that Sakai is very well connected in the Tokyo social scene and, to associate with him is to associate with his vast sea of acquaintances as well. Sosuke genuinely enjoys talking to Sakai, but is wary of running into mutual friends from his past whom he has wronged and would rather avoid. These interruptions prompt the narrator (distant, third person, slightly humorous and highly charitable) to circle back on the narrative and drum up the details of Sosuke’s past with Oyone. Whether due to a prior marriage or simply due to their families’ disapproval, the young couple are socially shunned when they wed and Sosuke must forsake a promising future at the imperial university for a future of, effectively, exile. This choice fundamentally reorients the trajectory of his life, which seems like a small price to pay when Oyone announces that she is expecting a child. The couple’s happiness is shattered (once, twice, and thrice) through a series of miscarriages and, at the point at which we encounter them in the narrative, they have abandoned the effort altogether. Thus, comparatively late in the novel, we are introduced to the feverish passion and bottomless disappointment that underscore the calm placidity of their household. Koroku’s arrival is reminder of their material destitution and of the path Sosuke could have pursued instead. Sakai’s social interest is a reminder of the people they alienated when they married. Soseki infuses every simple exchange between the couple (both verbal and mute) with hints of this subterranean electricity. And as the floor shifts beneath them and they are forced to once again addresses grievances they had long ago shelved, their habitual interactions take on different meanings: coming home late from work means something different on page 150 than it did on page 5, sleeping in on Sunday represents contentment early on, but depression thereafter, etc. Sosuke is eventually pushed to the point of a nervous breakdown and journeys off into the mountains in search of a monastery where he might spend some weeks meditating, clearing his head, and embracing spiritualist teachings. All of these are too foreign for him, though, and the trip is a failure. Indeed, Sosuke’s one evident pass at dynamism rings hollow because he cannot relax into his unfamiliar surroundings. It took years to erect his peaceful inner chamber with Oyone — it would take just as long for him to find peace in a spiritual community removed from her. But the book isn’t about the failure of spiritualism (indeed, any attempt at solving his problems would have failed) nor is it about the failure of society (you get the sense that Soseki disapproves of the rigid social conventions that alienate the couple, but this is not his primary concern). Rather, The Gate is about making decisions and then accepting the path that you’ve chosen for yourself. 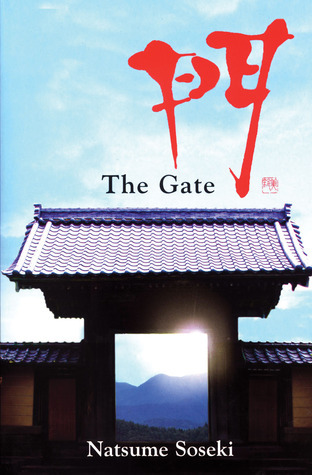 Late in the novel, Sosuke stands at a literal gate while imagining a metaphysical gate from which different paths emanate. He experiences a moment of regret at never being able to pass through the gate, to switch paths, to extricate himself from his deterministic arch. It is a pessimistic moment in a novel that is otherwise light and hopeful. The unique virtue of Sosuke’s path, however, is that he has actually chosen quite well in Oyone and, as the novel closes, they are once again able to return to the comforting entrenchment of their static domestic life. It might not be much, but it’s sufficient buttress against the outside world. The takeaway is heartfelt and humble: with the right partner at hand, a great many things are tolerable.